Object-Oriented Ontology and Scientific Naturalism | Larval Subjects . Let us focus on judgments of the form “All S are P”. The discourse of modernity is occupied with the question of whether ontology or being falls on the side of nature or culture, object or mind. Thus, if you are a scientific naturalist, your judgment has the form “All culture/mind/subject is nature.” This thesis is the thesis that cultural formation and subjects are reducible to materialistic principles, be they neurons or atoms. By contrast, if one is some variant of humanist or idealist, the proposition takes the form “All nature is culture/mind/subject”. Here the thesis is slightly more nuanced. With notable exceptions like Berkeley’s subjective idealism that claims that esse est percepi or that being is perception, or Hegel’s absolute identity that purports to establish the identity of substance and subject, the humanist decision is epistemological, not ontological. In other words, when the idealist of whatever stripe claims that “All nature is culture/mind/subject”, he is generally not claiming that mind, culture, or subject create the world in the manner that God generates the world from his thought. Rather, the idealist is making the claim that the world of natural objects is only ever the world as we represent it, such that we can know nothing of the world as it might be independent of our representations. What we call world is our representation. Consequently, while idealism nuances itself with a retreat into epistemology in its non-Hegelian and non-Berkeleyian forms, this retreat into epistemology nonetheless redeems ontology in the sense that it asserts that for all intents and purposes our representations are the most we can ever say about being. In other words, statements made by idealists that seem to straightforwardly be about objects always contain an implicit quasi-codicil such that all such statements are for us. While scientific naturalism and idealisms are heatedly engaged in a polemic as to whether all culture/mind/subjects are nature or whether all nature is culture/mind/subjects, the discourse of modernity is nonetheless agreed at the level of the universal negative proposition at the heart of their respective ontology. Thus, the scientific naturalist will happily proclaim that “No nature is culture” and the idealist will happily proclaim that “No culture is nature”. That is, as analyzed by Latour, the key move of modernity is a purification of the two domains of nature and culture, such that the two are to be rigorously separated and held apart at pains of social catastrophe, disaster, superstition, and horror. The great sin of pre-modernity, claims both the scientific naturalist and the idealist is to confuse the two domains of nature and culture, object and subject. Thus, the scientific naturalist believes that social progress will result from the progressive naturalization of the world. “No longer”, she says, “will we confuse the appearance of a comet with cultural epiphenomena like superstition that see it as a bad omen or sign! Through our understanding of physics, brains, chemistry, etc., etc., etc., we will finally free ourselves of these primitive confusions.” Likewise, the idealist sees the cardinal sin of pre-modernity as the confusion of properly cultural phenomena with “natural” phenomena. “No longer”, she says, “will we see laws and society as natural orders as in the case of the Great Chain of Being, but rather we must carefully keep nature and culture separate such that we see that it is we that produce nature, laws, and society.” As Deleuze puts it in his gorgeous little book on Kant, “the first thing we discover with Kant’s moral philosophy is that it is we who are calling the shots.” The moral law is no longer a natural artifact, but is rather something that the subject gives to itself in and through its autonomy. The key point not to be missed with OOO is that the realism of object-oriented ontology is not making a decision within the framework of this schema or partition between nature and culture. OOO is not preoccupied with the question of whether being falls on the side of nature or of culture. 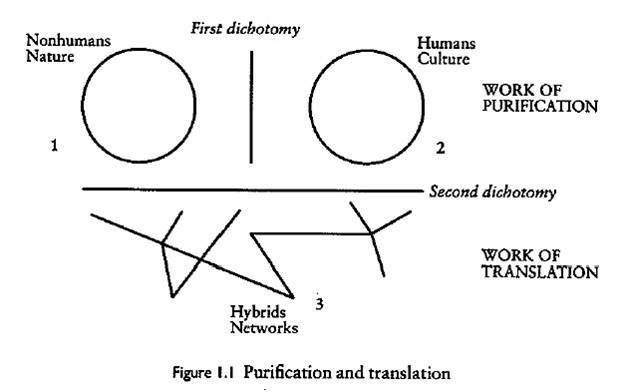 Rather, in drawing a transversal line across nature and culture, the issue is no longer whether being falls into the circle of nature and culture, but rather in establishing a flat ontology united around a third line in which both domains (and the OOO theorist need not even speak of incommensurable domains any longer) now equally are. This is an entirely different sorting of the world and of the question of ontology. 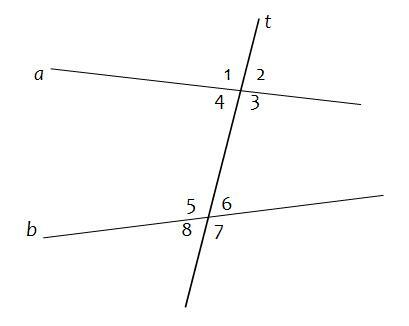 In the case of my variant of onticology, this transversal line is the ontic principle. If something makes a difference, then it is. To be sure, the object-oriented ontologist refers to all beings as objects, but this should not be confused with the position of scientific naturalism where the only real objects are physical or natural objects. With the scientific naturalist, the object-oriented ontologist is happy to agree that there are brains, atoms, quarks, black holes, hurricanes, and so on. These are all things that have distinct endo-relational structures composed of networks of differences and that make all sorts of differences when they enter into exo-relations with other entities. However, unlike the scientific naturalist, the object-oriented ontologist holds that fictional entities, works of art, signs, Sweden, the United States Constitution, norms, narratives, tables, subjects, etc., etc., etc., are objects as well. If the object-oriented ontologist is committed to a thesis as strange as the idea that a phoneme is an object or that Norway is an object, then this is because the criteria for being an object is not whether or not an entity is physical, but whether or not it makes differences. One might object that this is a tremendous abuse of the word object and what we mean when we refer to existence. “Harry Potter does not exist!” To be sure, there is no physical referent of the character of Harry Potter. However, the fictional character of Harry Potter certainly exists and makes all sorts of differences to all sorts of other objects. It will again be objected that this is an abuse of the term “existence”. At this point, it becomes necessary to press the defender of the thesis that existence is equivalent to being-physical. “What is this quality you refer to as existence? What is it for something to exist?” “Well Sir, to exist is to be physical!” “And”, the onticologist asks in good Platonic fashion seeking to get at the hidden presuppositions already implicit in the thesis, “what does it mean to be physical?” All sorts of answers will be given to this question, but ultimately at the end of the day, at the completion of the dialogue, it will be found that what the scientific naturalist was claiming all along is that to exist is to make differences. That which exists is that which is capable of producing differences. But if this is the case, then it follows that we should practice an egalitarianism of difference, thereby arriving at a flat ontology. If to exist is to be capable of making differences, then whatever makes a difference is. This egalitarianism or ontological difference is not the thesis that all beings equally make differences, that they are all equally important (a normative judgment), that all differences are desirable or valuable (another normative judgment), but simply that regardless of the degree to which something makes a difference, if a difference is made then that thing is. The smallest fluctuation in temperature is still a temperature and still a difference in temperature. Likewise, the smallest difference is still a difference and therefore something that is. 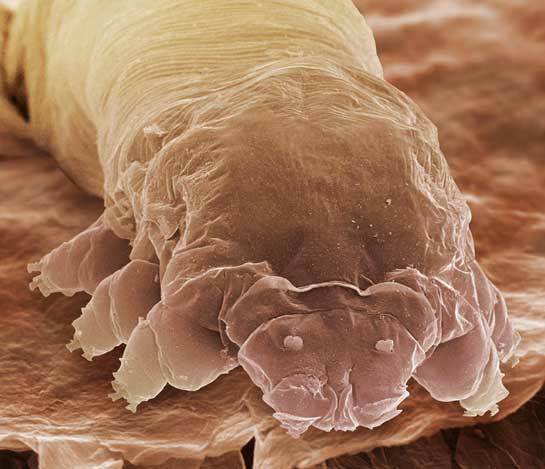 The microscopic mite or demodex that dwells in my eyelash makes very little difference to that lash or my body, but nonetheless makes differences and therefore is. Hey, no fair picking on a guy while he’s on a business trip! And by the time I get back, you’ll have written twenty-five more posts and this one will be ancient history! I think the problem is more with my inability to express myself clearly than with a misunderstanding. Or maybe it’s a misunderstanding of a different sort. I’m definitely with you on the transversal line – you’ve spoken of that a couple of times before. And I do get what Latour is saying (at least via Graham) about equal ontological footing. My hesitance, as a Second Philosophical type, comes from a couple of places. First, though I see the realism/idealism debate as not very interesting, it’s pretty clear to me that what takes place in our minds is a physical thing. It’s not an epiphenomenon, unless *everything* is an epiphenomenon. So to me, thoughts, concepts, Harry Potter, etc. have the same sort of physical reality as everything else. I’m tempted to say that everything is physical, but I don’t know if you really need a term for something when there’s only one thing. So if I were to go so far as to say that the criterion for existence is being physical, I wouldn’t be saying too much. In the end, this is not so different from saying that the criterion is “making a difference” — because, as you’ve said, you can’t name anything that doesn’t (and if you could, you’d know your criterion was wrong anyway). I have to run for a bit, but I hope that clears up my position a little bit. I like this post a lot, and it is making much more clear to me what you folks are talking about vis a vis OOO (I apologize for coming late to this party). I’d like to make a few comments along the lines of what I was saying in my comments on your earlier post, regarding Meillasoux’s arguments, which are also applicable here. Firstly I want to mention that, reading the above, defining objects as “things which make a difference” reminds me a great deal of Gregory Bateson’s emphasis on difference in his materialistic cybernetics. He is famous for saying “a difference which makes no difference is no difference”; which is to say, he was attempting, through his materialist cybernetics, to try to come to terms with how it is mental phenomena can arise from a materialist substrate, and from there he manages to come to conclusions that are surprisingly phenomenological given his materialist beginnings; i.e., that “making a difference” is what is key when trying to understand mental events (even from a materialist perspective). But when I read the above it is difficult for me to really see how what you’re saying differs in a fundamental way from idealism (which I am quite sympathetic to, I’ll state here at the outset). You’re clearly not asserting that the objects of your object-oriented ontology are necessarily *real*, in a naively realist sense —- that is to say, to say that an object “makes a difference” is to say it makes a difference *to us*, to an observer or within a community of observers, which brings us back to the idea of intersubjective agreement, language games, and so forth. In other words, Harry Potter makes a difference, electrons make a difference. But, from a physics perspective (I have some training in physics, as I noted in my other post), electrons are simply inferred from the evidence of various experiments. What they “really” are and how they “really” behave is obviously beyond the ability of scientists to nail down; what we have are the results of observations, we have theories, we have models, images, pictures. But we don’t have “actual” electrons. One thing which often strikes me when I read philosophers talking about the physical world is that some philosophers seem to have an assumption that the physical world has a sort of “definitely there” quality which I don’t happen to believe is quite warranted. Yes, to some extent, it does seem that the universe has a certain degree of structure that might be prior to mind — but there’s a lot less of that than it may appear. Quantum mechanics throws into question the objective reality of a past (unless one adopts radically nonlocal theories such as Bohmian mechanics), and suggests that the so-called past exists only relative to a particular observer; i.e., in some sense one can say the history of the universe is a retrogressive projection from an observer in the present moment. This of course raises the question of what an “observer” is — and this is an extremely tricky question, which I won’t try to address here, but it raises very fundamental issues in the area of quantum observation. Of course the philosophical questions to a large degree do not depend upon the specific resolution of these questions in the arena of physics; however, my point is that even when one considers a science as “hard” as physics, questions of the objective reality of “objects” arise and are actually quite difficult to resolve, and many of the physical theories have to explicitly take into account the relativity of the observer. I do think there is an advance available beyond asserting that the world is ONLY a matter of systems of symbols or ideas or language games — there is obviously some kind of constraint on the successful and unsuccessful language games (from the point of view of, say, biological-cultural-societal evolution) —- but the physical world and what we know about it is far more tricky and questionable than I think many philosophers unfamiliar with the technical details may realize. I hate to keep hammering away at a point, but it does at least force me to articulate myself better. There is a completely trivial sense in which claims about fictional existents (‘Harry Potter exists’) and material existents (‘the jet stream exists’) are the same. This trivial sense (a purely formal sense) allows us to make claims like ‘Harry Potter’s sister does not exist’ or ‘Harry Potter does not have a sister’, just as we make claims like ‘Bill Clinton does not have a sister’ (I don’t know if he does, but you get the point). The problem is that we want relativize such claims to fictional non-existence by adding claims such as ‘in the story’ or ‘in the official cannon’. It’s quite possible that someone has written a fanfiction in which Harry has a long lost sister (hell, I’d put money on it that someone has). In this case, who do we believe? How do we determine the truth of the claim ‘Harry Potter has no sister?’. There is an obvious answer in the case of Harry Potter, because we can give the original author sole and full authority over what exists and doesn’t exist in her fictional universe (indeed, over what properties and relations Harry does or does not have). But if you expand this to fictional objects like ‘Batman’ (for which there is no end of complicated self-contradicting cannon), or even better ‘Loki’ (or any mythological object which is the subject of multiple inconsistent legends), such easy answers are no longer open to us. No one has any obvious authority over whether Batman has a sister, or whether Loki has a father (or any other fictional existence claim which is indexed in relation to them). We could at this point say well, there are as many different Batmans and Thors as there are consistent cannons that can be put together out of all of the fictional resources available, but this precludes us from being able to say things like ‘Batman inspired me to become a Policeman’ or even ‘Batman is one of the most recognisable fictional characters in pop culture’, because they would have to be parsed as ‘Batman1 and Batman2 and Batman3… and BatmanN is…’. This is evidence indicating that what it is we’re talking about when using the latter two kinds of language, is not what we’re talking about when we say ‘Batman’s sister does not exist’, and therefore that it is a different kind of language from that used when we straightforwardly say ‘Batman exists’. When I say “Harry Potter does not exist”, and you say, “Of course Harry Potter exists” I can respond that “I agree that Harry Potter exists _in the story_, but he does not really exist”. The relevant difference is between the purely formal notion of existence (which is trivially common to all such talk) and this notion of real existence (or proper existence). An important point to note is that I need not equate real existence and physical existence to make the rejoinder. I could be happy to make claims about the real existence of numbers, and still deny the real existence of ‘Harry Potter’. The rejection of fictional entities need not be motivated by physicalism or materialism. The point here is that, although it is natural for us to talk this way, and on the face of it, such claims have the same forms as claims like ‘Harry Potter has no sister’ and ‘Harry Potter is a wizard’, they are not really the same kind of claims. We can tell this because of the kind of truth-assessment they undergo. The truth (or correctness) of claims like ‘Harry Potter does not have a secret half-sister’ depend upon the authority of the author, or upon some interpretation through which we try to uncover the intentions of the author amongst inconsistent cannon (which is still an indirect appeal to the authority of the author). On the other hand, the truth of claims like ‘Harry Potter has made a real difference in my life’ is not dependent upon the authority of anyone (not even upon any indirect appeal to authority through interpretation). It is in this sense objectively assessable, just like claims such as ‘The jet stream exists’ or ‘The boiling point of water is 100 degrees centigrade’. The claim ‘Harry Potter made a real difference in my life’ and the claim ‘Harry Potter is a wizard’ do not have the same referent. This is because in the former case the referent itself (along with the referent of ‘my’) determines the truth of the claim, whereas in the latter, the author determines its truth (be it directly or indirectly). This suggests that what it is that made a difference in your life is not a wizard, and is therefore not ‘Harry Potter’ in the proper sense. What made a difference in your life here is a cultural trope (or a ‘sign’ or whatever representational vehicle you want to cash it out as), which is an entity but not a fictional entity in the proper sense. A cultural trope is real, even if it is one induced by fiction. The measure of real existence is objective assessment, which is assessment which does not allow for any appeals to subjective (or even inter-subjective) authority. This implies that there is a notion of real existence distinct from formal existence, and a notion of objective truth, distinct from formal truth. What we’re interested in in doing ontology is saying what the specific content of this notion of real existence is. Materialism and physicalism (which are distinct positions) are just attempts to specify this content this (e.g., to be is to be material, or to be is to be a physical entity or to supervene on a set of physical entities). I hope I am edging towards clarity here. Yes Deontologist, you’ve been clear all along. Perhaps you could go ahead and clarify what you understand by existence and materialism. Thanks for the comments. I think you would be hard put to find a philosopher, realist or anti-realist, that advocates the naive view of scientist you seem to attribute to philosophers. In fact, the view you describe has been the dominant view among all but a small minority of philosophers for the past two hundred years. I think you’re here conflating issues of ontology with epistemology. Ontology investigates the most general features of being. My onticology, for example, simply holds that if something produces differences it is. By contrast, epistemology is concerned with the issue of what we can know and the conditions under which we know. With respect to your point about electrons, all I am committed to ontologically is that they produce differences. Whether or not the differences that particles produce on the instruments of scientists in the laboratory give us representations of particles as they are independent of these instruments is not at issue when talking ontologically. In other words, the realism advocated by OOO is not an epistemological representational realism, but an ontological realism. Now, if you think through the ontic principle or the thesis that to be is to make a difference, then you’ll see that your point about observation and knowledge is already entailed by this ontological thesis. If there is no difference that does not make a difference, whenever any two entities interact yet another difference will be produced. I refer to this second principle as the principle of translation, which states that “there is no transportation (of a difference) without translation.” In the process of translating a text from one language into another language the text is transformed and becomes something other than it was due to the difference in structures belonging to both languages. Onticology generalizes this phenomena to all inter-object interactions, such that the target-object affected by the source-object is never a simple vehicle of the difference transmitted by the source object, but rather transforms the difference it receives from the source object according to its own endo-relational structure. It is in this respect that onticology and OOO more generally is able to integrate all the claims of anti-realism or correlationism insofar as the various anti-realisms are simply investigating the manner in which one particular type of object (subjects) translate other objects. The difference is that onticology argues that this phenomenon holds for relations among all objects and is not unique to the human-object relation. An additional point: It seems to me that you’re conflating the being of objects with the affects that they produce. The fact that Harry Potter has such an such an effect on such and such a person is independent of its status as a being or object. Once Harry Potter has been written as a character, this character exists qua fictional object regardless of whether or not it has an effect on anyone else. In this regard, I disagree with the notion that authors have any particular authority over the objects that they produce. Once the object has come into existence it is every bit as much an object for the author– and a mysterious one at that –as a child is for a parent. Finally, in your talk about “talk about” it seems to me that you’re conflating how we talk about things with properly ontological issues. Regardless of how anyone talks about objects they are the objects that they are. The manner in which an object is talked about does not make it what it is. I just want to clarify my remarks somewhat about the naive view of philosophers — I’m speaking not of the philosophical positions of philosophers so much as their intuitions about the nature of the physical theories of scientists. I’m well aware of the dominant philosophical positions of the last couple hundred years. The point I am making is that I detect a strong sense, when it comes to these efforts to rehabilitate some form of realism, in particular in remarks by folks such as Meliassoux as you outlined them in an earlier post, that, while we can’t epistemologically justify realism, most of us have a suspicion that there really are things “out there” such as brains and electrons and so forth, and wouldn’t it be great to place this intuition on more solid philosophical ground? I’m merely trying to inject a bit of technical detail here in that the physical theories current today have a far different quality than the picture prevalent, say, 150 years ago and what people might have studied in high school or freshman physics (which stops around 150 years ago). With respect to ontology vs epistemology; the problem here is that there’s no way to be certain there even is a “thing” called an electron at all. What we call an electron is a feature of a theory. It’s possible that in fact there will come some better theory in the future in which everything is described only in terms of fields, and we discover that the idea that there are “electrons” is just a curious artifact of the dynamics of these fields. There’s no way of knowing for certain whether the ontological structure of our descriptions of the world may not be abandoned for a new description in which the term “electron” has no one to one correlate, just as in the past we gave up the idea of phlogiston, epicycles, the notion of absolute time, the idea of a universal simultaneity, and so forth. In fact in quantum theory today, what an “electron” is is already quite bizarre. In some sense every electron is quantum entangled with particles throughout the universe so that to speak of an electron as a thing is somewhat of an approximation. The universe is not made up of things which simply interact with each other, but rather it seems to be more of a completely interconnected whole which has, as a sort of approximation, the appearance of “things” but only from a certain perspective, when observed in a certain way, etc. I do agree, as I noted above, that it makes sense to talk about some sort of constraints on the evolution of language games; we can, I believe, fruitfully assume that language games are not entirely arbitrary. But to use the adjective “realist” along with “ontology” to me is unwarranted for the reasons I state above. I’ll add one more clarifying comment here, since I’m already anticipating one rejoinder. You may say that it doesn’t matter if electrons are later supplanted by a new theory which doesn’t feature the existence of electrons because you’re simply making a claim that the idea of an electron is a “thing” just as Harry Potter, a fictional character, is a “thing”. But if you take this position it seems to me you’re back in a relativism of some sort — these are “things” which make a difference to us, not “things in themselves” so to speak. I actually think this is a largely legitimate position but I don’t see why you want to use the adjective “realist” for this position; it appears, as I noted earlier, to be rather relativist or even anti-realist. I say “largely” because I also take issue with the use of the word “object” or “thing”. These words imply a certain self-contained quality, when in fact I see all of these “things” (electron, Harry Potter, etc.) as thinglike aspects of a whole that cannot be decomposed cleanly into things or objects. To call anything an object is just a convention of thought; in what sense do any of these thoughts, objects, concepts, whatever you want to call them, really exist in a “thinglike” sense (i.e., they all seem to exist only within a network of associations, with fuzzy boundaries, and so forth). I think it’s important to understand that the term “object” as used by onticology is a technical term that allows for a good deal of latitude as to just what counts as an object and how objects are structured temporally and spatially. It seems that when you express concerns about the term object you’re particularly worried about discreteness. This isn’t adequate to electrons because, as you note, electrons seem to be everywhere and nowhere and we have all these bizarre properties like quantum entanglement. Onticology is not opposed to such a point. The being of an object will be a function of the objects own endo-consistency, not a function of pre-set criteria such as discreteness, solidity, etc., etc., etc. I should also add that I’ve since moved on from Meillassoux. While I appreciate his argument against correlationism, the particular type of realism he advocates is not that of onticology. In subsequent posts I discuss some of the issues you mention pertaining to time, and I have subsequently published an article on Deleuze and time in Thinking Between Deleuze and Kant that closely approaches a number of your observations in your first post here. The object-oriented move strives to free up discourse such that the themes dealt with by philosophy can be broadened. Thanks for your response, quite interesting. I read the posts you referenced, as well as looked up some of your comments on endo-consistency. A few thoughts. After reading a bit about your idea of endo-consistency, however, I admit I don’t understand what you mean, precisely, by this. Again, I can’t help but feel that any ontological scheme has to have a certain arbitrariness; for example, is my body “endo-consistent”? I don’t think I can even precisely define the boundaries of my body, for example; when does an oxygen molecule cease to be part of the air around me and become a part of my body when I breath it in? I don’t think there’s any way, in general, to define precisely what an “object” is in any terms, even within the confines of most paradigms. But this doesn’t mean we can’t talk about objects, it just means such talk isn’t precisely well-defined. But why does it have to be? Why can’t we simply engage in discourse “as if”? We speak of a body “as if” it were an object, or Harry Potter as if it were an object, or an electron as if it were an object. Does it have to be precisely defined as an object to be spoken of? If we depend on precise definitions then we cut off the possibility of most speech, it seems to me. A better example would be talking about the “reality” of, say, phlogiston. Let’s suppose we were back in an era where phlogiston was considered real, would it then be helpful to talk about this as a “real” object, because it makes a difference within a particular theoretical picture? Why not just talk about it “as if” it were real, and leave it at that? Wittgenstein made the point that we can talk about things with certainty because that is how the language game is played. This is essentially the same idea as the “as if” notion. What’s wrong with adopting this position rather than using the charged term “realist ontology”? That’s really just a question, not a challenge. I’m curious. I wonder if Whitehead’s concept of prehensions might not be a helpful place to organize here. He suggests — I think — that each object/event has an indefinite number of possible modes of apprehension. Since each object has infinite ways of being prehended, the notion of the right way is an epiphenomenon related to the differences at work in the manner at hand. This allows for different prehensions and modes of prehension without a claim of the apotheosis of one over the others. Indeed, such claims of exclusivity tend to — and I think this is one of Levi’s central points — understand objects less well since they are hierarchical in advance so they become blind and or inarticulate to those differences that they register as lesser or unimportant. OOO does not delimit the possibility of the naturalistic or idealistic practice, it simply shows those to be partial in regard to the possibilities of differentiation. Certainly these two “polar” attempts create protocols and symbolic structures of mutual exclusion but the point of OOO is not to exclude differences, the indefinite plurality of prehensions, but to take them as its central claim. That element of OOO thrills me though other inclinations seem to often bring back the very hierarchies that seem excluded. There also seems to me an under-theorization of the epistemic/ontic crux and a lack of consideration of the form of philosophy. Good. I’ll try and clear some of that up then. I suppose I should first say where I’m coming from, insofar as I keep identifying as a materialist. As far as I’m concerned, as a Deleuzian, being a material thing is not a matter of being constituted out of a certain kind of stuff. It’s not about being composed by or supervenient upon a certain special set of entities (such as the fundamental particles of physics). Being a material thing is being a process which is situated at a certain spacio-temporal scale, composed out of processes at a lower scale, and potentially constitutive of processes at a higher scale. The real test of whether a bunch of smaller processes constitute a higher-level process is whether some new capacity emerges out of their interactions that was not present before. In short, to be material is to subsist in the causal interactions of one’s parts, yet to be causally efficacious in a way that exceeds the capacities of those parts. So, if you were to ask me what things I think are material things, I would say quarks, atoms, chemical systems, organelles, cells, organs, geological flow patterns, weather systems, families, cities, economies, solar systems, and galaxies, and indeed any process one can find insisting in any of them. I even think that an instance of a computer program (such as my web browser) is a material process, one which subsists in computer memory. With regard to existence, as I mentioned in the previous post, I think there is a distinction between a generic notion of existence, which is just that which we deploy in any thought and talk about anything, and the notion of real existence. I call those things that we talk or think about (generic existents) which aren’t real existents pseudo-existents. I agree with this insofar as we are talking about real existents. This is precisely what distinguishes the notion of real existence: anything which really exists, is, and is the way it is, independently of any way we happen to talk about it. However, there are objects of our thought and talk whose character is not independent of our thought and talk about them (though they need not be dependent on all of such thought and talk). These are pseudo-existents, or pseudo-objects. I take fictional entities to be perhaps the best example of pseudo-objects (which is why I am so interested in fictional existence), because whether or not ‘Harry Potter’s secret half-sister’ exists and what she is like (is she also a wizard?) is precisely dependent on talk about her (not just anyone’s talk) and only upon that talk (although this talk may be in writing). If there is no mention of ‘Harry Potter’s secret half-sister’ in any fiction, then we can legitimately say that there is no ‘character’ that goes by that description. Where a character is a different kind of object to an object that exists in the story. That there is no reference to her in the fiction does not necessarily settle whether ‘Harry Potter has a secret half-sister’ is true or false. Such questions of pseudo-existence can have indeterminate answers, e.g., ‘When Hamlet dies, are there any neutrinos passing through him?’, whereas questions like ‘is there a character in Shakespeare that goes by such and such a description’ always have determinate answers. In the latter case there is something which constrains our talk, whereas in the former case, an answer is correct only insofar as someone with authority sanctions it, or insofar as we suitably agree upon it, and declare it by fiat. The reason I discuss all of this in terms of ‘talk about’ objects, is that I take it that what Heidegger calls the pre-ontological understanding of Being is implicit in the structures of the way we ‘talk about’ things. The generic notion of existence, and the formal distinction between it and real existence, is something which I take to be implicit in our ordinary ways of talking about things. This doesn’t mean that our ordinary ways of talking about things are correct, but we must first understand their structure so that we can elaborate it into a correct understanding of Being. So, my personal commitments to materialism are independent of my endorsement of a distinction between pseudo-existence and real existence. To be is to be material is simply my elaboration of the content of the formal notion of real existence, or what I take the essence of real existence to consist in. This does not say what existence or materiality is, but is a list of entities you take to exist or be material. But what I asked for was not a list, but the existenceness of existence and the materialness of material. You reference process as something that might capture the existenceness of existence, but again we encounter the issue of the processness of process. But again, what is the realness of the real in this real existence you’re referring to? The thesis you seem to be making is that because Harry Potter is dependent on other things in order to be, Harry Potter must be a pseudo-existence. This strikes me as bad mereology. In your list of existing entities you give the example of cities. Yet if we go to the city of New York, no matter how are we look, we will nowhere find the city of New York among the bodies and material entities that are said to exist in New York. New York exists only in and through the agency of the people that live in New York, the laws that recognize New York, and so on. The New Yorkness of New York is incorporeal in the sense that it cannot be found among any of the material entities that compose New York. Entire generations of New Yorkers have lived and died, just as legions of people have moved in and out of New York over the years. The city has fluctuated in size, being now smaller, now larger. Buildings have been demolished in New York and others have been built. The function of buildings has shifted in New York. The laws of New York have perpetually changed. New York is a dependent existent in a whole host of ways. Not only is it dependent in Braudel’s sense of requiring influxes of energy in the form of electricity, food, and water to sustain itself, but it is dependent in the sense of sustaining itself in and through the agency of the citizens of New York and the recognition of people throughout the world, as well as sustaining itself through city, state, national, and international law. In this regard, New York does not differ in kind from Harry Potter, but in degree. We can say that as far as existences go, the existence of Harry Potter is rather flimsy and delicate, whereas the existence of New York is rather stubborn and strong. Yet the existence of a cloud or a storm or a tornado is rather flimsy and delicate when compared to the existence of a mountain or a tree. The point is that dependence on other entities is not, in my book, a sound criteria for determining whether or not an entity exists. Were this the case, we’d have to endorse some form of reductive materialism like Lucretian atomism and conclude that the only entities that meet the criteria of existence are fundamental particles. All things being equal, if New York exists despite being dependent in a whole host of ways, there is no reason not to make the same claim for Harry Potter. We can, of course, agree that Harry Potter is flimsier or more delicate in his existence than New York, closer to a cloud than to a tree. Nonetheless, we still have a very strange fictional entity here that is capable of producing all sorts of differences. I think I touch on the problem with this way of approaching the issue in my Alethetics of Discourse post. The question to ask ourselves is how adopting Wittgenstein’s strategy of discussing the world in terms of language games will effect the nature of our investigation should we adopt it. I believe that the answer is that we will be led to focus on language to the detriment of all sorts of other actors, causing the role played by these other actors to fall into concealedness or hiddenness. The charged term “realist ontology” helps to mitigate this. Your thesis seems to be that in order for an object to count as an object it must be well defined or have sharply defined boundaries. I am not committed to this thesis. My tendency is to think of objects as processes that generally, though not necessarily, have some interface with the world about them. Along these lines, I’ve lately been toying with the idea that the being of objects is incorporeal. That is, the being of the object is not its material existence, but its incorporeal endo-consistency across time; its pattern, if you will. I am still working through the concept of endo-consistency. Basically, the idea I have is that the endo-consistency of an object is the manifold of attractors belonging to an object across time in phase space. An attractor can be thought as a tendency towards certain states characterizing a system. Phase space can be thought as the potentials open to a system as a function of its attractors. The objectness of the object or its endo-consistency under this model, is not any particular state the object happens to occupy, but the affects of which the object is capable. Thus, for example, my coffee cup at this moment is a very deep blue. This is the actualization of a point-attractor in phase space resulting from the interaction of the cup with local lighting conditions. If I take my coffee cup outside into the bright Texas sun, it becomes a brilliant blue, shifting color as the result of a new interaction. Structurally the endo-consistency of the object remains the same but it is actualized in different ways depending on either its own internal conditions or depending on the exo-relations it maintains with other objects such as photons of light. If I’m inclined to think of the proper being of objects as incorporeal, then this is for precisely the reasons you suggest with regard to the body. The matter that composes the body is constantly changing. Cells dies and are reproduced. Other entities like oxygen are constantly fluxing through the body. Granting this, nothing material about the body remains the same, yet still somehow the objectness of the body persists through time. I thus conclude that the bodiness of the body is not its matter, but is this endo-consistent structure that persists throughout these processes. This incorporeal being of the object cannot exist apart from this matter, but is not identical with this matter. You’ve somewhat misrepresented me by claiming that I didn’t say what materiality was. I did give a brief description, and then went one to give a list of examples (which certainly was not meant to be exhaustive, only indicative). If you’re interested in a more detailed elaboration of the mereology I endorse, I’ve just put up a post about it (http://deontologistics.wordpress.com/2009/08/26/deleuze-the-song-of-sufficient-reason-part-2/). New York is large scale process like an organism, with flows of people and architectural geography that reciprocally constitute one another, it has sub-systems which play important causal roles in maintaining its dynamic (sanitation systems, electrical grids, traffic networks, and the various social systems that use these, as well as those that keep them working). These are complicated and interwoven networks of causal interaction (see Jane Jacob’s work for some detailed analysis). Cities are no more ethereal and immaterial than a hurricane is, or a population of organisms, or an organism itself. In this I’m on exactly the same page as DeLanda. It’s also important to get right my order of explanation: formal notion of generic existence, formal notion of real existence, then contentful notion of real existence. I take it that in making explicit our pre-ontological understanding of being, we find a formal distinction between generic existence and real existence. This is indeed a distinction is based on a kind of dependence. However, this dependence has nothing to do with mereology at all. Not all dependence is mereological. Pseudo-objects are not composed out of our talk. Fictional objects are not composed out of works of fiction. The dependence which is indicative of the formal distinction is not strictly an ontological dependence. I could go into the derivation of this difference in more detail (though I’m not claiming to have a definitive account of it), but I’ll try and keep this brief. Loosely, the difference is that existential claims about real objects are objective (in the sense that they are subject to objective assessment), whereas existential claims about pseudo-objects are non-objective (the kind of assessment they are subject to involves a different kind of argument, roughly equivalent to arguments of interpretation). The idea is that real existential claims are just generic existential claims arguments about which are precluded from having anything like an interpretational dimension, through which the truth of the claim would become dependent upon some form of authority, be it subjective or inter-subjective. The revelation of this distinction between generic existents that are independent from subjects and those which are not is what opens up the domain of the ontological. We are only dealing with what properly _is_ once we are dealing with that which we have no hand in deciding on the truth of. It is important to ram home the point that this formal dependence (subject’s having a say in whether claims about the object are true or false) is not the same as mereological composition. Our speech-acts can form part of some larger whole, say an argument, and the existence of this argument can be objective insofar as none of us has the authority to decide whether or how our speech acts go to constitute it (assuming we can characterise an ‘argument’ in non-normative terms). The former kind of dependence is formal, the latter is properly ontological. Once the domain of the ontological is open, once we have grasped the formal notion of real existence, then we ask the question of the existentness of existents, or the question of the beingness of beings (the question of metaphysics proper according to Heidegger). My proposed answer to this question is that the essence of existence proper is materiality. However, this is not the only answer one could have. My points about pseudo-existence and fictional existence are independent of my materialism. In short, ‘Harry Potter’, of whom we can say ‘Harry Potter is a wizard’ is a pseudo-existent, because of a formal feature of the discourse involving him. New York on the other hand, is a thriving real (and thus to my mind material) existent, which most likely has discourses as parts on which it mereologically depends. I’ve been meaning to post on this to expand my stuff on normativity and ontology, and this has been very helpful in forcing me to present a lot of these ideas clearly and in brief. Thanks. I don’t disagree with anything you’re saying here and even have cited such things in a number of responses to you. However, you seem to be missing the key point that the cityness of a city is not all of these material processes, but rather a city is symbolic entity. In other words, without this symbolic dimension the city wouldn’t exist. We thus find ourselves faced with an ontological choice: we can either say cities exist or that they do not exist. Given what you have said about symbolic entities such as fictions, your ontology commits you to the thesis that cities do not exist because the cityness of the city is nowhere to be found among all of the material processes you describe. By contrast, we can make room for symbolic entities in our ontology so as to account for the existence of things like cities. This is the move I’m making. However, if this move is made, this also entails that we have to rethink the ontological status of things like fictions. The problem with this move is that you’re making folk ontology (our pre-ontological understanding of being) the arbiter of ontology or the real. As such, you fall into correlationism. I agree that we should make this folk ontology explicit, but not as a tribunal or measure of ontology. Okay, I think I understand the project you’re trying to undertake here. I have two primary objections. First, I’m glad you’re aware of the fuzzy boundaries of your concept of object. But if you accept this, then your notion of “endo-consistency” ends up being little different from the notion of “as if” which I outlined above. You talk about the “interface” of an object, which is a sensible enough idea, but this interface can only be defined in conventional terms, i.e., as it relates to a particular conventionally-established model or theory or idea, and since the criteria on which one is to decide whether something has the property of “endo-consistency” is vaguely defined, it has to again depend on socially accepted norms — i.e., you’re back to the problem of subjectivity again (not that I think this is a problem). The example of “phlogiston” again comes to mind; a substance which one might, under some circumstances, decide can be treated as an object or thing, yet only with reference to a paradigm or view of the world which we now believe is entirely unreal. The same might be said for any other concept we talk about; they all exist within a given language game whose “objective” reality may or may not have any “reality”. There’s ultimately no way of knowing for certain which elements of our ontology are “real” or not — one can look towards their properties as delimited within a particular language game, but that’s it. Is that all you mean by “endo-consistency”? I.e., it seems “thinglike” within the constraints of a given view of the world, a given language game? I agree there’s a difficulty with the tendency to focus on the purely subjective aspects of discourse, and reintroducing some notion of something beyond that is worth doing. But I still have significant objections both to the term “realist” and “object”. There are very significant pitfalls associated with these terms. For example, suppose one is talking about a subject such as ethics — in such a domain it is quite easy to forget the cultural-specific nature of many of the terms of discourse, and to use the word “realist” to describe the elements of this discourse appears to me to make it far more difficult to see this in practice. Another example would be something like the difference between the Western biomedical model of medicine and, say, that of traditional Chinese medicine; there is empirical evidence that suggests both have therapeutic benefits, yet the language games associated with these two paradigms are incommensurable at present. This is a result which is easy to understand and deal with by looking at it in terms of “as if” and in terms of evolutionary success — two incommensurable language games can both have an element of “truth” to them, despite their incommensurability, but this is harder to see if we are committed to thinking of them in realistic terms. Finally, there’s simply the question of new paradigms in the development of a single civilization or culture, i.e., for example quantum mechanics and relativity are in fact inconsistent physical theories, yet we use both; or Aristotelian physics vs Newtonian physics, etc., even though both paradigms arose within the same culture and in fact in some cases are both still used — further a notion that is easily accomodated by the “as if” approach, but something which seems a bit funny when talking in terms of “realism”. The word “realist”, in short, seems to imply something more than “thinglike within a theory”. It seems to imply some sort of reality “out there” which I assume you’re trying to evoke. But there are many examples of thinglike entities in prior theories which we now reject as fantasy, and similarly we even know of symbolic entities within contemporary theories which we understand to be merely conceptual conventions without a direct correlate in “reality” as we may understand it from a more updated theory. To resolve these sorts of frictions it seems to me you always have to come back to some form of subject relativity. Again, I sympathize with your overall project: trying to bring back into philosophy something which allows one to talk about something beyond subjectivity — and I agree that there is something beyond pure subjectivity (in that subjectivity in its extreme seems to imply a kind of solipsism or a notion that one can just believe whatever the hell you want), but I have to say I’m unconvinced by the attempt to do this by resurrecting both the word “realist” and the word “object” (but, I certainly enjoy reading your posts on the topic)! All these issues you’re raising belong to the domain of epistemology, not ontology. The issue of what we can know about objects, how that is culturally influenced, of the models we make, and so in is distinct from the question of the being of objects. I think my post on Circulating Reference makes pretty clear that all sorts of mediations take place in the process of inquiry. Well, I suppose what I am saying is I don’t actually believe it is possible to separate epistemology from ontology as you seem to imply, unless I’m misunderstanding what you mean by ontology. Another way of putting it is that I believe the only ontological commitment one can make is to Being (in a sort of holistic, all-encompassing sense); any other category of being (things, objects) can only be said to exist in a sense contingent with a theory, language game, view, etc., with the caveat that this theory or language game is in some sense in dynamic interaction with Being in the sense of “circulating reference” which you described in the above post. In other words, to go from being critical of your approach to proposing an alternative: I think it’s perfectly reasonable to posit Being as in some sense “prior” to all language games, subjectivity, etc., a Being which cannot be said definitively to have any particular properties, but one which constrains in a way which cannot be specified the evolution, survival, etc., of language games. However, any and all objects, terms, concepts, etc., *within* a given language game, it seems to me, can only be said to have “reality” with reference to a particular language game (which is, in turn, in relationship to Being in the sense I describe above). To speak, therefore, of the “beingness of objects” seems to me to be incoherent —- I think one can speak of Being as a whole, but I don’t see how one can speak of the beingness of an object, except insofar as an object participates as an element in a language game which itself is embedded, as a whole, in Being. What you write here accounts for why I refer to the position I’m articulating as a realism rather than an anti-realism. I do not accept the thesis that ontology is inseparable from epistemology. Yes, but so far it doesn’t seem that your arguments for this add up. You seem to accept the validity of many anti-realist objections, but you then just assert by fiat that despite this you can talk about the beingness of an object — but I don’t see how you justify making this leap, which appears to me to be entirely unwarranted. Let me see if I can get more clear on what you mean by a thing. You say that Harry Potter is a thing, even though it has no referent in the physical world. I can certainly accept this as a reasonable point of view, but as I noted above, that means you accept the “thingness” of concepts which exist solely in the world of discourse, ideas, etc. However, you then go on to note that most of my objections to your use of the term “realist” are epistemological questions — which implies that you do care to some extent about some sort of correspondence between an idea and something else (the “actual” thing?) Is this true or not? I.e., let’s suppose I were to talk about the “phlogiston inside this tree trunk”. Would you say that that phrase is an object or a thing in your terminology, or not? Or is the question of whether or not it is a thing dependent on whether or not the phlogiston theory is “true” or not? If one is to actually worry about whether or not an object is “real” or not, then one enters into another serious problem. I would assert that many language games contain terms which are useful and are still used today but may not have any referent in the “real world” as we understand it based on more sophisticated theories. For example, Maxwell’s equations refer to electric and magnetic fields; yet in modern theories of quantum electrodynamics, these are seen not to have any real-world correspondence; what is “really” happening may be better thought to be the exchange of virtual photons by charged particles. Yet physicists still use electric and magnetic fields “as if” they were real, and this works. Does your idea of the “beingness of objects” actually depend on a notion of correspondence, or not? If you answer yes, then I think we diverge significantly; if you answer no, then it seems to me we’re thrown back to a radical relativity. I.e., any “thing” in a paradigm or language game, I would assert, only has meaning or utility when considered in the context of the entire language game, paradigm, or whatever you want to call it. The thing cannot be cleanly separated out from its language game, in other words, whereas the word “thing” implies a sort of existence on its own terms, by itself. These are not merely philosophical considerations, but in fact are things which certainly come up in physics and come up I believe in nearly every other field of discourse. In other words, the answers to these questions have practical implications, which is why I personally care about these subjects so much, myself. I’ve been really enjoying this discussion. Unfortunately I can’t respond in detail right now as I still have to get my dinner together, but maybe this will shed some light on what I’m getting at. When I generalize the claims of anti-realism to all objects, no longer treating it as a problem specific to the human-object relation, the issue shifts from the domain of the epistemological to the ontological. The anti-realist revolves around the issue of how mind, culture, language, etc., translate the object. The thesis of onticology (indebted deeply to Graham Harman’s ontography) is that this phenomenon is true of all relations. Thus, for example, in receiving light the plant transforms those photons of light into sugars. Light is translated into something else. The plant never grasps “light qua light” as it is. So the thesis here is that all objects withdraw from one another in their differential interaction. All of this aside, are you still working in physics or have you since moved on? We have a great love of physicsts here at LS. Let me just say that I am *very* sympathetic to the notion that the “transforms” as you call it aren’t restricted to human beings. The objection I have is to the use of your term “object”. I certainly accept the notion that there’s nothing particularly special about human language games. Rather than the phrase “language game” I might put in the more phenomenological term “life world” to generalize it more fully. I was thinking about this a little more and I’ll rephrase my objection slightly. The issue I have is that I believe that it makes sense to talk about the tuple (object, language game/life world, Being) but not (object) by itself. For example, “the phlogiston in this tree trunk” I think is quite reasonably said to be a “thing” — in the *context* of the language game, embedded in Being. In other words, I don’t believe it makes any sense to talk about phlogiston as having beingness *in itself*, but it does make sense, in a limited way, perhaps to talk about its beingness *combined together with its language game, embedded in Being*. Perhaps this was clear already but I thought I’d add that. Levi: I’m working on a post that attempts to respond to your more important objections by present my own approach in a more systematic way. I’ll link it here when it’s up. I will question one thing you say here though. You claim that a city is a symbolic entity, and I’m having a great deal of trouble trying to understand what you mean by that. Surely (as Jacobs tries to show) cities (with their characteristic people flows and such) will have formed before we explicitly recognised them as such, before we had any way of dealing with them symbolically. In precisely the same way as economies existed before Adam Smith came along and we started representing them symbolically. I find it hard to see how the cityness of cities essentially involves their symbolic character anymore than the economyness of economies. The only sense I can make of the claim is that cities involve symbolic interaction, i.e., communication amongst the individuals within the city is an essential part of it. But I can see no reason why this makes a city ethereal or immaterial in any way. Ant colonies involve communication amongst the individuals that make them up, and they are perfectly material. Can you explain why exactly a city is a symbolic thing? Thank you for this very integrating post and idea. I think it interfaces with information theory, since information is defined as a unit of difference in signaling terms, and is also defined in physics as real, having equivalents in energy/mass by way of their interconvertibility with entropy. So Harry Potter exists, as an idea and as a flood of information, as real as any physical object. The subjective experience is still a bit difficult to define, but it is real in terms of information internal to our brains. What would you say about my impression, that the idea of OOO perfectly fits the Marx formula which describes commodity fetishism as a way of seeing social relationships between men as if they were merely relationships between things (Wolfe, 1985, p. 324)? I think this conclusion or thesis presupposes that OOO restricts objects to a particular type of object, i.e., nonhuman objects. Within the framework of OOO humans are a type of object as well. Moreover, as I’ve argued in my posts on social systems, social systems are objects as well. While social systems are, like any other object, entities that have an endo-relational structure of their own, the relations that compose that structure are not just relations between humans but are relations between all sorts of nonhuman entities such as natural objects, the planet, animals, technologies, etc., as well. At any rate, I think that one has to have a very limited and narrow conception of what counts as an object to see OOO as somehow identical to what Marx was denouncing under the title of commodity fetishism. Thank you for giving me a brief explanation and linking the appropriate sources. My point was a half-serious/half-provocative attempt to get a better grasp of what it’s all about. When I get through those posts you linked, I’ll leave more stupid comments like that.